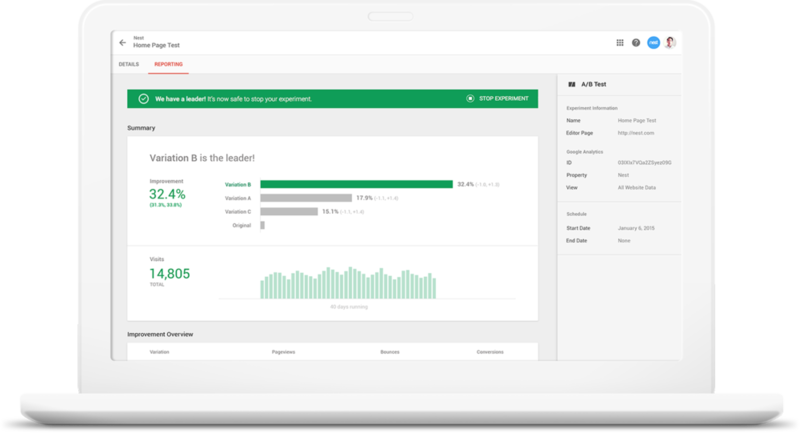 Google’s announced the new enterprise version of their analytics product – the Google Analytics 360 Suite which will replace Google Analytics Premium and see the addition of new complementary products. It’s expected to improve online experiences, provide granular audience targeting and meet the ever-increasing analysis needs of organisations. The announcement sees a much clearer distinction between Google’s digital analytics platforms for enterprise customers compared to small to medium businesses (SMBs). This is made clear on the updated Google Analytics website where we now have to choose between ‘Enterprise’ and ‘Small Business’. Well, basically it's one part of the Analytics 360 Suite and it will replace Google Analytics Premium. The range of products in the suite will allow organisations to pick and choose the products they need, from data visualisation to delivering personalised content. Data Studio 360 allows you to pull multiple data sources to create data visualisations and reports to power your analysis. Who should use the Analytics 360 Suite? Although 67.1% of the top one million websites use Google Analytics, the simple answer is large enterprises – if this is you, then you should consider the Analytics 360 Suite. However, it really comes down to how much you are currently investing in digital. If you’re an SMB, then the Analytics 360 Suite is likely to be overkill. How does this impact the free version of Google Analytics? Google’s announcement doesn’t have any immediate impact on the standard version of Google Analytics. Over time, we might see some features of the Analytics 360 Suite make their way into the standard version, but I wouldn’t hold your breath. Following the release of Google Analytics Premium, we saw some features, like the Attribution Model Comparison Tool, become available to all Google Analytics users. It’s highly unlikely that we will see Audience Center 360 or the other tools popping up in the standard version. What’s changing and what’s new? Google Analytics Premium becomes Analytics 360, the premium version of Google Tag Manager becomes Tag Manager 360 and Adometry is now Attribution 360. But along with these changes, there are also entirely new products being launched. Google Analytics has struggled to attract people to its testing solution (Google Analytics Content Experiments) since it replaced the much-loved, but overly complicated Google Website Optimizer tool in 2012. Optimize 360 is Google’s answer to popular tools like Optimizely and VWO (Visual Website Optimizer). The product will allow you to run tests and deliver personalised experiences to your audience. The adoption of Optimize 360 will likely come down to three things – firstly, the price may be prohibitive for organisations, secondly, ease of use and finally the level of integration with data from Google Analytics 360 and other data sources. Since Optimize 360 is part of the suite, Google’s providing a more integrated and streamlined experience. You can target audience members based on Analytics 360 data, just like you would create a segment inside the standard version of Google Analytics. This opens up the ability to create more meaningful experiences for your audience and run tests to defined groups of people as they engage with your brand. In order to create experiments, Optimize 360 includes a visual editor, similar to other tools on the market. This makes it easy to select elements within your live website that you would like to test. Once you’ve created your test, you can launch and monitor your results within Optimize 360. Audience Center 360 will bring together and combine separate data sets in order to better understand your audience. This means you’ll be able to combine first-party data from your website, your CRM and any other existing data you have about your customers (and prospects) along with third-party data, like demographics data pulled from external sources. Apart from richer insights, Audience Center 360 will seamlessly integrate with Google’s advertising platforms (along with other platforms). This will mean that targeting advertising to particular groups of audience members will be a much smoother experience for advertisers. There are times when the Google Analytics reporting interface doesn’t quite provide the exact format or visualisation options you need. Maybe you need a one-off graph or a custom dashboard for your team – well, this is where Data Studio 360 fits. There are lots of third-party data visualisation and reporting tools on the market, like Klipfolio, Tableau and Geckoboard. If you’re using the Analytics 360 Suite, you can shift your regular and ad-hoc reporting and visualisation to Data Studio 360. The tool will allow you to create visualisations that combine separate datasets, for example, you can include data from your CRM, with EDM campaign data and website audience data. It’s a bit like the existing Google Analytics dashboards, but with more flexibility and more options to customise the way you present your data. When will the Analytics 360 Suite be available? A select few Google Analytics Premium clients and Google Analytics Premium Resellers have been using the beta versions of the products (or had the chance to test-drive them). Google is famous notorious for never forward-announcing launch dates for their products and this is the case for Analytics 360 too. Paul Muret from Google has said that Google Analytics Premium customers will be able to access Google Analytics 360 soon with “the products renamed in the coming months”. Three of the new products – Audience Centre 360, Optimize 360 and Data Studio 360 are still in beta, which means we’re likely to see a slower roll-out of these products. Anyone looking to use the Analytics 360 Suite will be able to sign up for the full lineup or pick and choose the products that they need. This will mean organisations can benefit from using the products they need and then extending their use as their needs evolve. Who’s currently using the Analytics 360 Suite? Along with the product announcement, Google has highlighted various Analytics 360 Suite clients, including Progressive, L’Oreal and Nest. Why is Google’s announcement important? The core difference between Google Analytics Premium and the Analytics 360 Suite is that Google is no longer trying to maintain a single product. Instead, by providing organisations with the flexibility to pick and choose the products they need, the solution is in a much stronger position to change and evolve to meet the needs of organisations at different stages of digital analytics maturity. When combined with email addresses from your CRM, you’ll be able to be even more precise with the targeting of your ads. Combined with over 50 data providers integrating with Audience Center 360, it’s clear that the suite of products is positioned to become an extremely integral part of enterprises worldwide. Having a clean, consistent and universal set of customer data will make it easier for organisations to understand their existing and prospective customers. How will this impact the analytics space? Industry leader, Stéphane Hamel, has posed two interesting points, firstly, it “isn’t good news for [Google’s] competitors,” and secondly, since the Analytics 360 Suite comes at a premium price, that there will continue to be competition in the space. How complementary tools to Google Analytics, like Optimizely will fit into this new ecosystem will be closely watched. We’ve already seen Optimizely announce cutting 10% of their team, so how Google’s announcement further impacts their business and other similar vendors will be interesting. When Google originally released Google Analytics to the world back in 2005, they instantly made web analytics accessible to everybody who had a website. It was truly amazing. I think the Analytics 360 Suite announcement will have a similar effect for enterprise users – the ability to integrate datasets, deliver personalisation and provide meaningful customer insights will mean we see another evolution in digital analytics and online marketing. If Google maintains their current pricing (with Google Analytics Premium costing $150k per year), there will continue to be space for other vendors. And since Google’s announcement doesn’t see any new features or products aimed at small businesses, we might see an increase in entry-level tools to extend the standard (free) version of Google Analytics. There’s always a role for tools that provide clever, simple solutions to businesses of all sizes. Where can I read more about the Analytics 360 Suite? Older PostNow That Google’s Removed Right Hand Side Ads from Search Engine Results Pages, How Should you react?